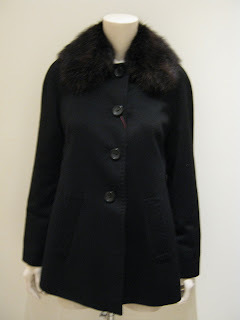 MaxMara fox fur collar wool coat!!! To die for! My new favorite dream is MaxMara! I have had them on my radar for years, but being a freelance fashion designer in this economy does not afford me such luxuries. The other day I went into the MaxMara store in Pacific Place, an upscale shopping mall in downtown Seattle and I tried on a few of their amazing, luscious winter 2009/10 coats. I fell in love with a black mid knee length wool coat with a removable fox fur collar. I love fox, I have two jackets with fox and they are so gorgeous and just really soft to wear, makes one feel glam. OMG, its soooo gorgeous! I totally would of purchased it on the spot if I had been able to...but I know I have to pay the mortgage first and then see what is left over. The sales girl was kind enough to send me a photo of the coat. This photo does not do it justice its one of those coats you have to try on in person to really appreciate the quality and the beauty of the fit.